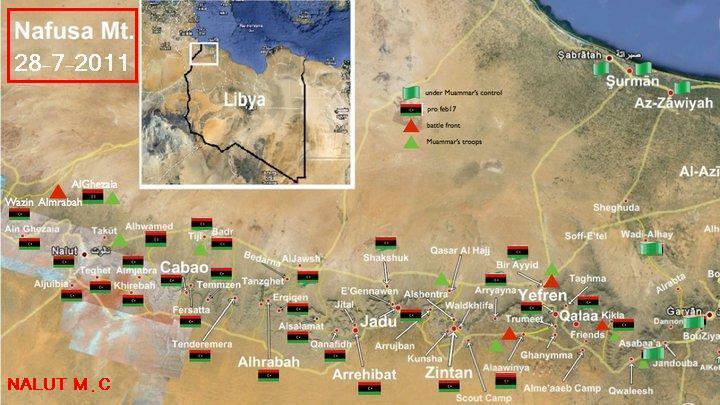 Some talk about a stalemate in Libya, but just check out this map showing the progress of the Revolutionaries, otherwise known as Libyan Freedom Fighters, in the battle for the Nafusa Mountains in the western part of the country. Please remember these guys started out with knives and hunting rifles less than three months ago; their weapons have largely been seized from Gaddafi forces after their defeat and retreat. Thank you to the Libyan Revolution CentralÂ Feb17.info website.